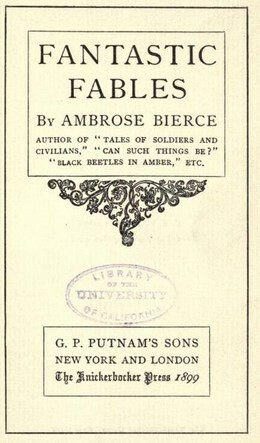 Ambrose Bierce is well known for his war stories: An Occurrence at Owl Creek Bridge, The Boarded Window, Killed at Resaca, Chickamauga; and his ghost stories: Present at a Hanging, A Wireless Message, A Vine on a House, A Baffled Ambuscade. But Bierce was also able to write in other genres as well, and his 1899 publication of Fantastic Fables anticipated the grotesquerie style that would emerge in the 20th century, exemplified by the works of Katherine Anne Porter . A YOUNG Ostrich came to its Mother, groaning with pain and with its wings tightly crossed upon its stomach. "What have you been eating?" the Mother asked, with solicitude. "Nothing but a keg of Nails," was the reply. "What!" exclaimed the Mother; "a whole keg of Nails, at your age! Why, you will kill yourself that way. Go quickly, my child, and swallow a claw-hammer." These are brief and wonderful tales exhibiting yet another facet of Bierce's wit and talent. You might also enjoy his short parable, The Dog and the Bees. Return to the Ambrose Bierce library.